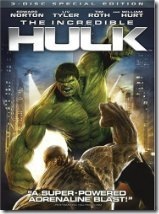 Smashing into our living rooms on DVD, October 21 is The Incredible Hulk. A must own movie! There are some problems with the story line and maintaining the immaculate reality of the experience but overall they kept true to the spirit of the Hulk. I really enjoyed this version of the Hulk even though it had it’s flaws it got a lot right. You can read my full review in Exploring: The Incredible Hulk. The Incredible Hulk is a tale about Bruce Banner the Geneticist and his quest for a cure for a condition that turns him into a raging monster known as the Hulk. All the while the military is hunting down Bruce Banner so that they can learn how to control the Hulk and use Bruce’s research to create super soldiers. In the end they only create an even more deadly monster known as The Abomination.